New York, U.S.A.-based Luke’s Lobster is making its first big retail push with two new offerings designed to give consumers an easy way to have lobster in their own home. 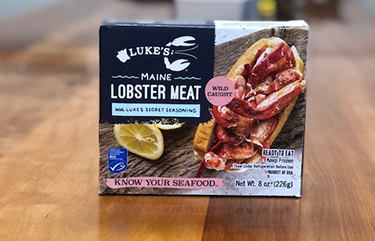 Luke’s is offering a “ready-to-eat lobster kit” featuring half a pound of lobster knuckle and claw meat, a packet of Luke’s Lobster seasoning, and instructions on how to make a lobster roll in the restaurant’s style at home. The other item is a “ready-to-cook lobster tail kit” that contains two raw Maine lobster tails; some lemon garlic marinade; and tips on how to thaw, prep, and prepare grilled marinated lobster tails. Both items are priced at USD 19.99 (EUR 17.55) and debuted in Whole Foods Markets across the country on 16 November. The move is the first big push by the company into retail nationwide, according to a representative for Luke’s Lobster. “Luke’s did offer retail for a few months, but this is our first serious foray into retail,” the representative told SeafoodSource. The two new items use same-day flash-freezing of either the raw or cooked lobster, and will be found in the frozen foods aisle at Whole Foods Markets. The items also come with Marine Stewardship Council certification, and each kit comes with information on the dock that the lobster was caught at. “These new products will allow Luke’s fans across the nation to enjoy the best lobster available, even if they live thousands of miles away from a Luke’s Lobster shack,” a press release by Luke’s Lobster said. While the kits come with directions on how to make lobster rolls or grilled tails, Luke’s suggests that the lobster inside can also be used for other items, too. “These Luke’s kits are perfect for adding rich twists on cold-weather faves — think lobster mac and cheese, lobster stuffing for your holiday table,” Luke’s said. The new items are coming just a few months after the company signed a long-term lease for dock space in Portland, Maine, and after the company opened a new restaurant in San Francisco, California.